A colorful choice for a groundcover or edging. The rich blend of purple and green foliage has a slight metallic sheen that compliments other silvery-foliaged plants and pastel flower shades. 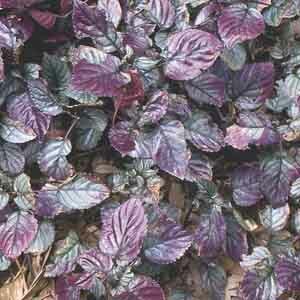 Plant near green or gold foliage plants for an intense color contrast. Can be grown as a perennial in frost-free climates and makes a terrific potted plant for indoors. Ideal for edging patios, borders and walkways. A good choice for rock gardens and spilling over the edges of mixed container plantings. Plant in well drained soil and fertilize regularly.